FREE Primary Constraints Evaluation - Audiology Management Group, Inc.
Are you frustrated by the lack of growth in your audiology practice or hearing aid clinic? Are you looking to capture more market share? Do you want to increase the profitability of your hearing aid sales? Audiology Management Group has over six years of experience in evaluating and supporting audiology clinics and practices. We are experts in improving revenue in businesses like yours, so don’t put off your move to greater profits any longer. amg network’s Practice Performance Model is a wheel that powers continuous improvement within your business. As the wheel spins, three drivers create momentum. Within each of the three drivers of performance there is the potential for gaps in the patient experience. By addressing the gaps, we fuel the wheel to ensure power performance in your practice. Demand Generation: To thrive, every practice needs to attract new patients. We deliver the strategy, tools and support services that you need to position your practice as a leading healthcare provider in your community, increasing sales opportunities. Service Delivery: From patient financing to staffing, we provide you with the solutions you need to streamline the patient process. Excellence in service delivery ensures maximum satisfaction, increasing your sales and keeping patients coming back. 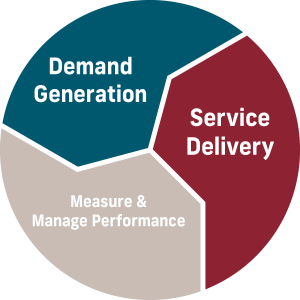 Measuring & Managing Performance: amg network’s expertise helps you set meaningful key performance indicators so you can ensure you’re on track as you drive towards your strategic goals. Through this process, we can identify and resolve key growth opportunities and support their implementation. The result is accelerated revenue growth and increased return on investment. Happier patients, more revenue—what more could you ask for? We have plenty more to offer! With a comprehensive suite of unique business support services, we are able to offer a custom approach to your business based on your unique needs to deliver higher revenue for you. We can help you save money by improving procurement costs, lowering credit card processing fees, and lowering patient financing interest rates. And these are just a few of our cost-reduction and revenue-building services. Call now to schedule your FREE evaluation and find out what we can do for you and your ENT or audiology practice today!